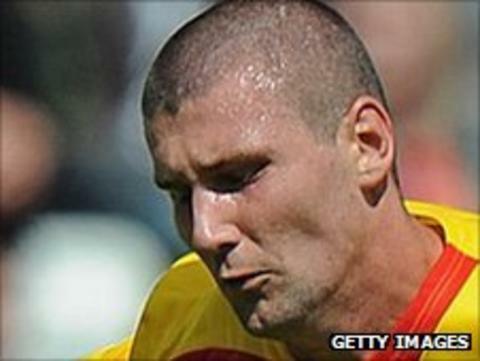 Kidderminster Harriers have signed former Darlington striker Tommy Wright on non-contract terms. The 26-year-old told BBC Hereford and Worcester he is hoping to earn himself a longer deal. "I came down last Wednesday for the behind-closed-doors friendly against Walsall and that went well," he said. "Obviously I am delighted to sign and it gives me the chance to try to impress and hopefully earn myself a bigger contract." Wright's arrival at Aggborough is a timely one as Harriers' experienced striker Steve Guinan is about to begin a three-match ban following his red card in the 5-2 midweek defeat at Fleetwood Town. Wright's former clubs include Barnsley and Leicester City, and he also enjoyed a two-year spell with SPL side Aberdeen, who paid £75,000 for his services. He twice featured for Darlington against Harriers last season and impressed the Aggborough club's manager Steve Burr. "This is a deal that suits both parties really, especially with us losing Steve Guinan for three games," said Burr. "Tommy is a good player and someone who is keen to come in and prove himself. "He has a good opportunity to try to earn himself something more permanent and we're looking forward to working with him."